Die Mercurii, 22 Julii, 1646. ORdered, That Mr. Henry Herbert do, from this House, give Thanks unto Mr. Wilkinson, for the great Pains he took in the Sermon he preached Yesterday, at the Intreaty of this House, at St. Margaret's, Westminster, it being the Day of Publick Thanksgiving; and to desire him to print his Sermon: And he is to have the like Privilege in Printing of it, as others in the like kind usually have had. Ordered, That Mr. Recorder do, from this House, give Thanks unto Mr. Craddock, for the great Pains he took in the Sermon he preached Yesterday, at the Intreaty of this House, at St. Margaret's, Westminster, it being the Day of Publick Thanksgiving; and to desire him to print his Sermon: And he is to have the like Privilege in Printing of it, as others in the like kind usually have had. 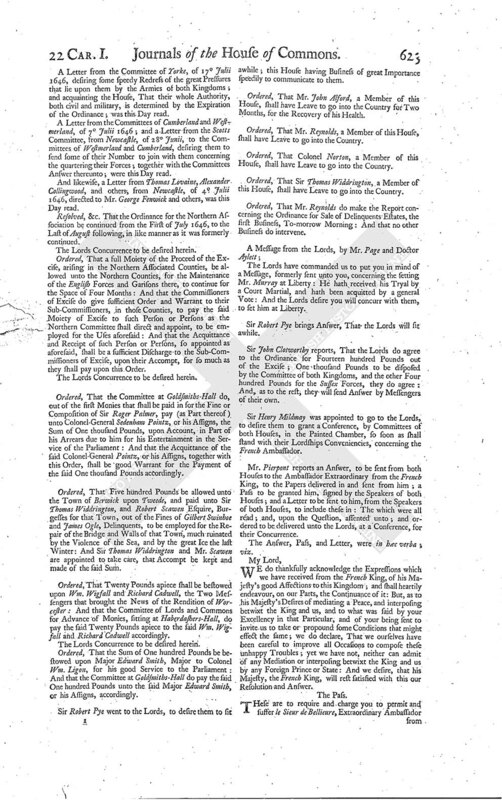 An Ordinance for constituting Mr. Richard Simonds, Henry Walter, and Walter Cradock, Ministers, to preach itinerantly in the several Counties of South-Wales; and for allowing each of them One hundred Pounds per Annum out of the Rents and Revenues of the Deans, Deans and Chapters, and Prebends, of St. Davyd's and Landaffe, for their Pains; and likewise for constituting a Committee to sequester the said Rents and Revenues, and pay the said Stipend to the said Ministers out of them; was this Day read; and, upon the Question, passed; and Ordered to be sent unto the Lords for their Concurrence. Resolved, &c. That Mr. Recorder do prepare and bring in an Ordinance for settling Committees, for the better establishing the Affairs of North-Wales, for putting the Ordinances of Parliament in Execution, and for settling a Preaching Ministry there; and for taking care for providing Maintenance for them; and for sending down Ministers that may be able to preach in the Welch Tongue; and for appointing a Standing Committee to take notice of, and overview the Actions of, the several Committees of those Counties; and to consider of Members of this House to go into those Counties; and to prepare Instructions for them. Resolved, &c. That this House doth nominate and approve of Richard Meyrick Esquire to be Sheriff of the County of Anglesey: And that the Commissioners for the Great Seal of England do issue a Commission to him to be Sheriff of the said County accordingly. Resolved, &c. That this House doth nominate and approve of Thomas Williams Esquire to be Sheriff of the County of Caernarvon: And that the Commissioners for the Great Seal of England do issue a Commission to him to be Sheriff of the said County accordingly. Ordered, That the Committee formerly appointed for North-Wales, or any Five of them, shall have Power to meet. Ordered, That the humble Petition of the Justices of the Peace, Gentry, and other the Inhabitants of the County of Radnor, and of the County of Brecon, be referred to the consideration of the Committee of North-Wales. Ordered, That the humble Petition of divers Inhabitants of the several Places adjoining to the new Church in Tuthill-Fields, Westminster, be read To-morrow Morning, the first Business. They were called in: And Doctor Burges acquainted the House, That Doctor Twisse, Prolocutor of the said Assembly, died on Sunday Morning last; and humbly desired to know the Pleasure of the House, for the further ordering themselves, and their Proceedings, upon this Occasion; in regard there is no Provision made in the Ordinance, whereby the Assembly sit, for the Supply of that Place, in case of the Prolocutor's Death; though there be in case of Absence, or Infirmity. Resolved, &c. That this House doth nominate and approve of Mr. * Herle, one of the Members of the Assembly of Divines, to be Prolocutor of the Assembly of Divines, in the place of Doctor Twisse, late Prolocutor, deceased. Mr. Tate, being appointed, carried the same to the Lords for their Concurrence accordingly. Ordered, That the Sum of One hundred Pounds be forthwith paid, out of the Revenues of the Archbishoprick of Canterbury, to be employed for the Burial of Doctor Twisse, late Prolocutor of the Assembly of Divines, deceased: And that the Committee of the Revenue do pay the said One hundred Pounds to his Executors, or such as they shall appoint to receive the same, accordingly. Ordered, That it be referred to the Committee of the Three Counties of Oxon, Bucks, and Berks, to consider of the Condition of Doctor Twisse's Children; and to provide Support and Subsistence for them, to remain unto them, in Testimony of the great Deserts of their Father, both from this Church and Kingdom: And they are to consider where to fix this Maintenance; and to bring in an Ordinance for the Establishing of it. Ordered, That the Assembly of Divines be earnestly moved to expedite the Catechism, and the publick Consession of Faith: And the Members of this House that are of the Assembly, are to acquaint the Assembly of Divines herewith. Mr. Speaker reported the French King's Credential Letters to his Ambassador Extraordinary Le Sieur de Bellieure, directed, "A Messieurs les Pairs et Communes du Royaume d'Angleterre, assembléz au Parlement d' Angleterre à Westminster." These Credentials, being translated into English, were read. Mr. Speaker further reported a Letter, directed, "A Monsieur Monsieur Lenthall, Speaker de la Maison des Communes du Parlement d' Angleterre." The which, being translated into English, was read. 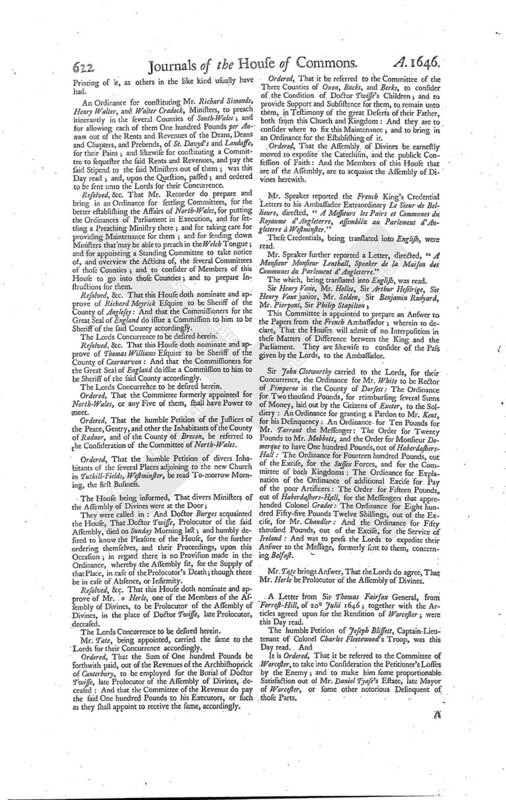 This Committee is appointed to prepare an Answer to the Papers from the French Ambassador; wherein to declare, That the Houses will admit of no Interposition in these Matters of Difference between the King and the Parliament. They are likewise to consider of the Pass given by the Lords, to the Ambassador. Sir John Clotworthy carried to the Lords, for their Concurrence, the Ordinance for Mr. White to be Rector of Pimperne in the County of Dorsett: The Ordinance for Two thousand Pounds, for reimbursing several Sums of Money, laid out by the Citizens of Exeter, to the Soldiery: An Ordinance for granting a Pardon to Mr. Kent, for his Delinquency: An Ordinance for Ten Pounds for Mr. Tarrant the Messenger: The Order for Twenty Pounds to Mr. Mabbott, and the Order for Monsieur Domerque to have One hundred Pounds, out of HaberdashersHall: The Ordinance for Fourteen hundred Pounds, out of the Excise, for the Sussex Forces, and for the Committee of both Kingdoms: The Ordinance for Explanation of the Ordinance of additional Excise for Pay of the poor Artificers: The Order for Fifteen Pounds, out of Haberdashers-Hall, for the Messengers that apprehended Colonel Gradee: The Ordinance for Eight hundred Fifty-five Pounds Twelve Shillings, out of the Excise, for Mr. Chandler: And the Ordinance for Fifty thousand Pounds, out of the Excise, for the Service of Ireland: And was to press the Lords to expedite their Answer to the Message, formerly sent to them, concerning Belfast. Mr. Tate brings Answer, That the Lords do agree, That Mr. Herle be Prolocutor of the Assembly of Divines. A Letter from Sir Thomas Fairfax General, from Forrest-Hill, of 20 Julii 1646; together with the Articles agreed upon for the Rendition of Worcester; were this Day read. It is Ordered, That it be referred to the Committee of Worcester, to take into Consideration the Petitioner's Losses by the Enemy; and to make him some proportionable Satisfaction out of Mr. Daniel Tyase's Estate, late Mayor of Worcester, or some other notorious Delinquent of those Parts. A Letter from the Committee of Yorke, of 17 Julii 1646, desiring some speedy Redress of the great Pressures that lie upon them by the Armies of both Kingdoms; and acquainting the House, That their whole Authority, both civil and military, is determined by the Expiration of the Ordinance; was this Day read. A Letter from the Committees of Cumberland and Westmerland, of 7 Julii 1646; and a Letter from the Scotts Committee, from Newcastle, of 28 Junii, to the Committees of Westmerland and Cumberland, desiring them to send some of their Number to join with them concerning the quartering their Forces; together with the Committees Answer thereunto; were this Day read. And likewise, a Letter from Thomas Lovaine, Alexander Collingwood, and others, from Newcastle, of 4 Julii 1646, directed to Mr. George Fenwick and others, was this Day read. Resolved, &c. That the Ordinance for the Northern Association be continued from the First of July 1646, to the Last of August following, in like manner as it was formerly continued. Ordered, That a full Moiety of the Proceed of the Excise, arising in the Northern Associated Counties, be allowed unto the Northern Counties, for the Maintenance of the English Forces and Garisons there, to continue for the Space of Four Months: And that the Commissioners of Excise do give sufficient Order and Warrant to their Sub-Commissioners, in those Counties, to pay the said Moiety of Excise to such Person or Persons as the Northern Committee shall direct and appoint, to be employed for the Uses aforesaid: And that the Acquittance and Receipt of such Person or Persons, so appointed as aforesaid, shall be a sufficient Discharge to the Sub-Commissioners of Excise, upon their Accompt, for so much as they shall pay upon this Order. 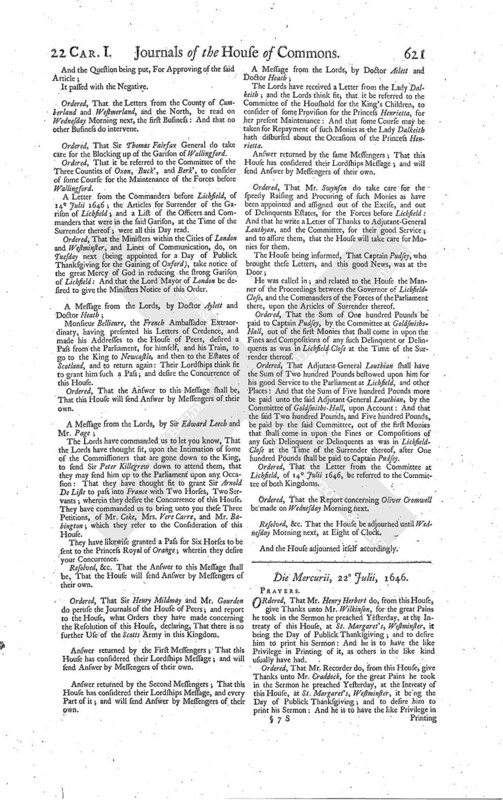 Ordered, That the Committee at Goldsmiths-Hall do, out of the first Monies that shall be paid in for the Fine or Composition of Sir Roger Palmer, pay (as Part thereof) unto Colonel-General Sedenham Pointz, or his Assigns, the Sum of One thousand Pounds, upon Account, in Part of his Arrears due to him for his Entertainment in the Service of the Parliament: And that the Acquittance of the said Colonel-General Pointz, or his Assigns, together with this Order, shall be good Warrant for the Payment of the said One thousand Pounds accordingly. Ordered, That Five hundred Pounds be allowed unto the Town of Berwick upon Tweede, and paid unto Sir Thomas Widdrington, and Robert Scawen Esquire, Burgesses for that Town, out of the Fines of Gilbert Swinhoe and James Ogle, Delinquents, to be employed for the Repair of the Bridge and Walls of that Town, much ruinated by the Violence of the Sea, and by the great Ice the last Winter: And Sir Thomas Widdrington and Mr. Scawen are appointed to take care, that Accompt be kept and made of the said Sum. Ordered, That Twenty Pounds apiece shall be bestowed upon Wm. Wigfall and Richard Cadwell, the Two Messengers that brought the News of the Rendition of Worcester: And that the Committee of Lords and Commons for Advance of Monies, sitting at Haberdashers-Hall, do pay the said Twenty Pounds apiece to the said Wm. Wigfall and Richard Cadwell accordingly. Ordered, That the Sum of One hundred Pounds be bestowed upon Major Edward Smith, Major to Colonel Wm. Ligon, for his good Service to the Parliament: And that the Committee at Goldsmiths-Hall do pay the said One hundred Pounds unto the said Major Edward Smith, or his Assigns, accordingly. Sir Robert Pye went to the Lords, to desire them to sit awhile; this House having Business of great Importance speedily to communicate to them. Ordered, That Mr. John Alford, a Member of this House, shall have Leave to go into the Country for Two Months, for the Recovery of his Health. Ordered, That Mr. Reynolds, a Member of this House, shall have Leave to go into the Country. Ordered, That Colonel Norton, a Member of this House, shall have Leave to go into the Country. Ordered, That Sir Thomas Widdrington, a Member of this House, shall have Leave to go into the Country. Ordered, That Mr. Reynolds do make the Report concerning the Ordinance for Sale of Delinquents Estates, the first Business, To-morrow Morning: And that no other Business do intervene. 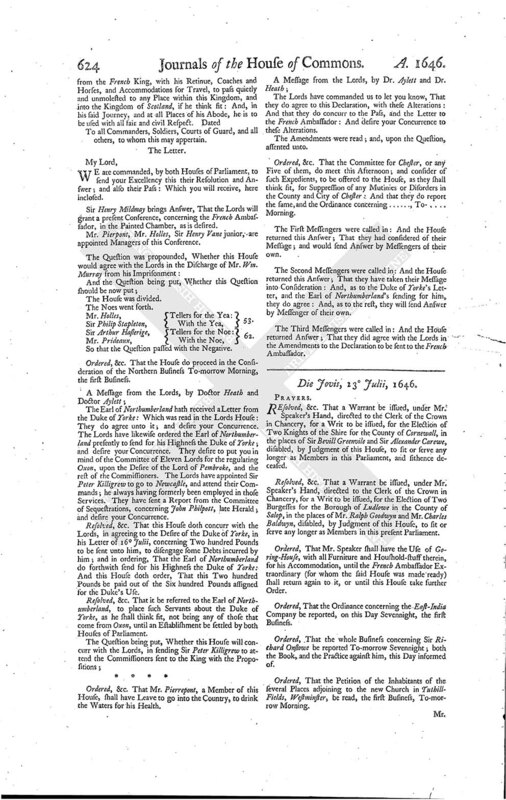 The Lords have commanded us to put you in mind of a Message, formerly sent unto you, concerning the setting Mr. Murray at Liberty: He hath received his Tryal by a Court Martial, and hath been acquitted by a general Vote: And the Lords desire you will concurr with them, to set him at Liberty. Sir Robert Pye brings Answer, That the Lords will sit awhile. Sir John Clotworthy reports, That the Lords do agree to the Ordinance for Fourteen hundred Pounds out of the Excise; One thousand Pounds to be disposed by the Committee of both Kingdoms, and the other Four hundred Pounds for the Sussex Forces, they do agree: And, as to the rest, they will send Answer by Messengers of their own. Sir Henry Mildmay was appointed to go to the Lords, to desire them to grant a Conference, by Committees of both Houses, in the Painted Chamber, so soon as shall stand with their Lordships Conveniencies, concerning the French Ambassador. Mr. Pierpont reports an Answer, to be sent from both Houses to the Ambassador Extraordinary from the French King, to the Papers delivered in and sent from him; a Pass to be granted him, signed by the Speakers of both Houses; and a Letter to be sent to him, from the Speakers of both Houses, to include these in: The which were all read; and, upon the Question, assented unto; and ordered to be delivered unto the Lords, at a Conference, for their Concurrence. The Answer, Pass, and Letter, were in hæc verba; viz. WE do thankfully acknowledge the Expressions which we have received from the French King, of his Majesty's good Affections to this Kingdom; and shall heartily endeavour, on our Parts, the Continuance of it: But, as to his Majesty's Desires of mediating a Peace, and interposing betwixt the King and us, and to what was said by your Excellency in that Particular, and of your being sent to invite us to take or propound some Conditions that might effect the same; we do declare, That we ourselves have been careful to improve all Occasions to compose these unhappy Troubles; yet we have not, neither can admit of any Mediation or interposing betwixt the King and us by any Foreign Prince or State: And we desire, that his Majesty, the French King, will rest satisfied with this our Resolution and Answer. To all Commanders, Soldiers, Courts of Guard, and all others, to whom this may appertain. WE are commanded, by both Houses of Parliament, to send your Excellency this their Resolution and Answer; and also their pass: Which you will receive, here inclosed. Sir Henry Mildmay brings Answer, That the Lords will grant a present Conference, concerning the French Ambassador, in the Painted Chamber, as is desired. Mr. Pierpont, Mr. Holles, Sir Henry Vane junior, are appointed Managers of this Conference. Mr. Holles, Tellers for the Yea: 53. Sir Arthur Haslerige, Tellers for the Noe: 62. Ordered, &c. That the House do proceed in the Consideration of the Northern Business To-morrow Morning, the first Business. The Earl of Northumberland hath received a Letter from the Duke of Yorke: Which was read in the Lords House: They do agree unto it; and desire your Concurrence. The Lords have likewise ordered the Earl of Northumberland presently to send for his Highness the Duke of Yorke; and desire your Concurrence. They desire to put you in mind of the Committee of Eleven Lords for the regulating Oxon, upon the Desire of the Lord of Pembroke, and the rest of the Commissioners. The Lords have appointed Sir Peter Killigrew to go to Newcastle, and attend their Commands; he always having formerly been employed in those Services. They have sent a Report from the Committee of Sequestrations, concerning John Philpott, late Herald; and desire your Concurrence. Resolved, &c. That this House doth concurr with the Lords, in agreeing to the Desire of the Duke of Yorke, in his Letter of 16 Julii, concerning Two hundred Pounds to be sent unto him, to disengage some Debts incurred by him; and in ordering, That the Earl of Northumberland do forthwith send for his Highness the Duke of Yorke: And this House doth order, That this Two hundred Pounds be paid out of the Six hundred Pounds assigned for the Duke's Use. Resolved, &c. That it be referred to the Earl of Northumberland, to place such Servants about the Duke of Yorke, as he shall think fit, not being any of those that come from Oxon, until an Establishment be settled by both Houses of Parliament. Ordered, &c. That Mr. Pierrepont, a Member of this House, shall have Leave to go into the Country, to drink the Waters for his Health. The Lords have commanded us to let you know, That they do agree to this Declaration, with these Alterations: And that they do concurr to the Pass, and the Letter to the French Ambassador: And desire your Concurrence to these Alterations. The Amendments were read; and, upon the Question, assented unto. Ordered, &c. That the Committee for Chester, or any Five of them, do meet this Afternoon; and consider of such Expedients, to be offered to the House, as they shall think fit, for Suppression of any Mutinies or Disorders in the County and City of Chester: And that they do report the same, and the Ordinance concerning ......, To- .... Morning. The First Messengers were called in: And the House returned this Answer; That they had considered of their Message; and would send Answer by Messengers of their own. The Second Messengers were called in: And the House returned this Answer; That they have taken their Message into Consideration: And, as to the Duke of Yorke's Letter, and the Earl of Northumberland's sending for him, they do agree: And, as to the rest, they will send Answer by Messenger of their own. The Third Messengers were called in: And the House returned Answer; That they did agree with the Lords in the Amendments to the Declaration to be sent to the French Ambassador.